ShowerGuard glass is the first shower glass that provides permanent protection against corrosion and staining. Insulated glass is the perfect window solution for both residential and commercial projects. The insulated glass unit, or IGU, is designed with two panes of glass separated by a spacer. Tempered glass is the strongest type of glass that can be used in any application. 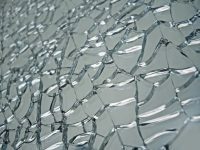 Should the glass shatter — it uniquely breaks into small, less jagged pieces than a standard glass pane. Flat Edge, Pencil Edge, Bull Nose edge and more offerings perfect for your next commercial glass project. New Angle Beveling’s skilled team of manufacturers, modern technology, and state of the art machinery work together to produce high-quality glass. The results are beautiful pieces of commercial glass that look stunning in any design. Heat treating glass is done to improve its strength, as well as its resistance to cracking or shattering. Beveled glass is made by taking large pieces of glass and creating an angled surface around the entire edge of the glass. If you’re looking for a way to take the elegance and allure of any commercial design up a notch, opting for custom manufactured commercial mirrors is the way to go. Triple glazed glass is an insulated glass unit that offers even more strength and insulation that a traditional unit through an additional pane of glass included in the design. As part of our strong focus to detail in custom products; we are able to add edgework to your glass work designs in a variety of styles. Find out all of the edgework styles and their applications that are available in one easy downloadable guide. Download this guide and take a tour behind the scenes of tempered glass manufacturing. Plus, learn about why tempered glass is the perfect solution for your next commercial glass project based on the applications it’s best for, and the shapes it can be made in. ShowerGuard glass is the only solution that provides permanent protection against corrosion. Follow this downloadable guide to learn how to clean the glass properly and keep it looking brilliant… permanently. Browse frequently asked questions from others ordering custom glass. Additionally, get detailed information about how to order our products. We manufacture and distribute glass products for commercial installations across the Northeast, including: PA, NY, DE, NJ, MD, & OH. Our attention to detail on fabricated custom-shaped pieces has allowed us to supply glass to customers with demanding requirements that others are not able to provide in industries such as glass shops and home improvement contractors; commercial glazing contractors; furniture, window and equipment manufacturers; Division 8 construction materials, and many more. Allow us to become one of your most trusted vendors and see how New Angle Beveling can increase your satisfaction in quality, accuracy, and lead time.